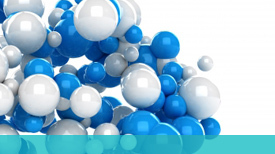 We employ the use of chemical analysis techniques to determine the source of the efflorescence from any site location while obtaining sample for testing. To inquire about these and other testing services email us at services@h2obtech.com or fill out the form below to get in touch with us. Someone will get in touch with you about your site specific questions. Contributing Factors: Efflorescence requires the movement of moisture. 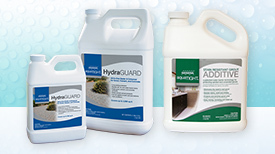 Without moisture movement there would be no efflorescence on the surface to create the problem. Unfortunately, too many finishers (non-ACI Certified Finishers) routinely introduce large amounts of unnecessary “water of convenience” to the mix in order to facilitate concrete placement. Primary efflorescence is caused by the water in the concrete evaporating from the slab leaving behind the soluble salts on the concrete surface. The fact that these salts are actually more soluble in colder temperatures coupled with increased bleed water in cold weather increases the likelihood of efflorescence showing up after winter concrete placement. Contributing further to efflorescence with cold weather pours is the use of calcium chloride to accelerate the set time. High slump concrete and the addition of calcium chloride are major contributors to efflorescence. In these scenarios, efflorescence remover is necessary. Secondary efflorescence is often described as water coming from underneath the slab or water that is introduced from the surface. Likely sources of secondary efflorescence would be a saturated base material, an improperly drained site or excessive amounts of water used by the decorative flooring contractor during his cleaning process – rinsing off the acid stain residue, for example. When extra mix water and extra soluble salts from calcium chloride are added to concrete placed in cool weather followed by more water from the decorative processes, some degree of efflorescing is bound to occur. Again, an efflorescence remover is needed. DEFINITION: ef-flo-res-cence (ef le res’ens), 1. a change on the surface to a powdery substance upon exposure to air, as a crystalline substance through loss of water. 2. to become encrusted or covered with crystals of salt or the like through evaporation or chemical change. A chemical analysis of efflorescent salts in the Southern California area (1) reveals that they are principally alkalies of Sodium Sulfates (Na3S04) and Potassium Sulfates (K2S04). These are the main soluble salts to be concerned with in Southern California since these are 90 percent of the efflorescence found in this area. These alkali sulfates appear because they exist somewhere within the masonry wall, either in the brick, the mortar, or the grout, or possibly a combination of these three. 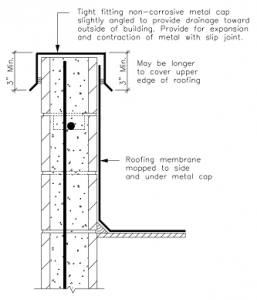 Pictures and content courtesy of: Scientific analysis of efflorescence from the following source: “MIA Masonry Institute of America”, https://www.masonryinstitute.org, MIA, Accessed 22 August, 2016. “Based on a technical paper written by Michael Merrigan, P.E., originally published in The Masonry Society Journal, January-June, 1986” or for download CLICK HERE. Concrete efflorescence is a crystalline deposit, usually white, that may develop on the surfaces of masonry construction (see Fig. 1). Often it appears just after the structure is completed—when builder, architect, and owner are most concerned with the appearance of the new structure. Although unattractive, efflorescence is generally harmless. However, some forms (alkali carbonates) may be able to saponify paints, leading to failure of the paint-masonry bond. Other deposits can occur within the surface pores of the material, causing expansion that may disrupt the surface. This condition is sometimes termed cryptoflorescence. This information sheet examines the causes, prevention, and removal of efflorescence encountered on masonry surfaces. For more information download the source file below. Pictures and content courtesy of : “ Portland Cement Association”, “Cement.org”, http://www.cement.org/docs/default-source/fc_mat-app_pdfs/masonry/is239-pca-efflorescence.pdf, PCA, 22, August, 2016. This publication is intended SOLELY for use by PROFESSIONAL PERSONNEL who are competent to evaluate the significance and limitations of the information provided herein, and who will accept total responsibility for the application of this information. 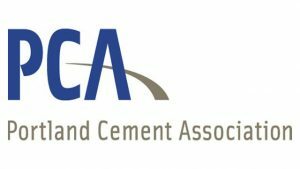 The Portland Cement Association disclaims any and all RESPONSIBILITY and LIABILITY for the accuracy of and the application of the information contained in this publication to the full extent permitted by law. 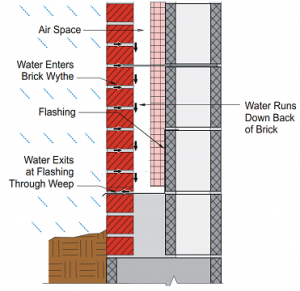 There are many, often complicated, mechanisms of brick efflorescence. Simply stated, efflorescence occurs when water containing dissolved salts is brought to the surface of masonry, the water evaporates and the salts are left on the surface of the masonry. The salt solutions may migrate across surfaces of masonry units, between the mortar and units, or through the pores of the mortar or units. 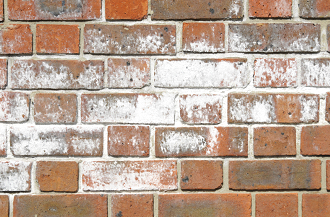 Soluble salts must be present within or in contact with the brickwork. These salts may be present in brick, backing materials, mortar ingredients, trim, adjacent soil, etc. There must be a source of water in contact with the salts for a period of time sufficient to dissolve them. The masonry must have a pore structure that allows the migration of salt solutions to the surface or other locations where evaporation of water can occur.